Homepage > Featured > The Hispanic Church in the U.S. The Hispanic Church in the U.S.
Discipleship has similarities and differences across diverse cultures. If I am to talk about discipleship, I must first start by talking about my own experience. I came to have a personal relationship with Jesus under the mentoring and discipleship of an American missionary in Venezuela named Johnny Dye. I was raised in a Catholic home and lived my faith like many others in Venezuela—focused on religion, not relationship. I accepted the missionary’s invitation to visit his church, and I went with my wife and my then 4-year-old daughter to check it out. Of course many things were different from the Catholic church I was used to visiting. When the service ended, I remember one lady came to us and started talking to us about getting baptized that day. I felt that we were being pushed too far in that first visit, so we were completely discouraged to visit again. Johnny realized what had happened. Instead of inviting us to his church again, he started to invest his time with us and intentionally developed a closer relationship by pouring himself into our lives for many months. After this time and friendship developed, it was me asking him to go to his church. This started my faith journey that brought me to the U.S. and that is now is leading me toward God’s calling. The way Johnny Dye discipled me is the way I discipled some friends here in Cincinnati. Some of the aspects that define Venezuelans are that we are highly relational, very social, familial, kind, and happy. Many of these aspects also hold true for the Hispanic culture as a whole in Central, South, and North America. These generalized characteristics of Hispanics contribute favorably to the success of discipleship within the Hispanic church. As a disciple making disciples here in the U.S., God has opened doors for me to bring to faith some Hispanic families and to help them walk their first steps in Christ as new believers. As an international seminary student at Cincinnati Christian University (CCU), the courses I took taught about the church and ministers in the United States. 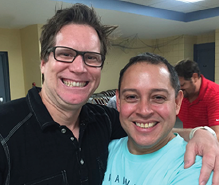 Yet in the fall of 2012, Chris Irwin, a CCU alumnus who had lived with his family as missionaries in Ecuador for 17 years, came for a semester and taught a course in exactly what I had been hoping to find: “Ministering Among Hispanics in the U.S.” As a Latino training for ministry, I had a natural interest in the Spanish-speaking church in the U.S. At the time I did not know much about the Restoration Movement, Spanish-speaking churches in this country. This course opened my eyes on how big and important the Hispanic church and the Hispanic community in general is in the U.S.
America’s Hispanic population totaled 56.6 million as of July 1, 2015, making them America’s largest ethnic or racial minority. Hispanics are predominantly Catholic (69 percent, according to a 2014 Pew Research survey). Nonetheless, the Protestant population has been gaining ground in recent years. The same survey asked Protestant Hispanics why they converted, and most said they were seeking a more personal connection with God. In November 2013 I met Mario Lara in a workshop at ICOM. Mario is currently the National Executive Director of the Convencion Nacional Cristiana or National Christian Convention (the Hispanic equivalent of the North American Christian Convention). Mario is also the senior minister of Iglesia de Cristo Puente de Vida (Lifebridge Church of Christ) in Iowa and an advocate for Latino church growth and for leadership formation within the Hispanic churches of Christ. He gave me valuable data that is hard to find elsewhere. For example, he mentioned that there were only 170 Hispanic Churches of the Restoration Movement in the U.S., and most of them very small in size (100 congregants or less). He said one of the main things that the Hispanic church lacks is formal leadership training or seminary training of ministers and this is hindering the growth of the Latino church in general. Another unfortunate fact he communicated is that Hispanic ministers are typically compensated less than their American counterparts. For this reason they have to take one or two extra jobs in order to provide for their families, taking away hours that could be dedicated to ministry. When I came to the U.S. in 2011 to do seminary studies, I could say that I was still an infant in the faith. I was blessed by being taken under the wing of a spiritual disciplines professor who taught me and discipled me along my years as a student. I owe a huge part of my spiritual growth to this incredible man of God. To this day his influence has a daily impact in my spiritual life. Having lived in Cincinnati for the past five years, I have observed the growing number of Hispanics who live in this city and in particular my neighborhood. The first three years in town I became part of the Latino Church at Western Hills Church of Christ and that is where I was ordained. One thing I realized during this time was that not all Hispanics want to hear a sermon in Spanish. Second- and third-generation Hispanics prefer to hear a sermon in English. This does not mean that they want to lose their ties to their Latino culture, but Spanish-speaking services are mainly for first-generation Latinos. Later I was able to initiate a Hispanic Sunday School class at Christ’s Church because the leadership was aware of the growth of Hispanics in the Mason area. I have been involved with several Spanish-speaking churches in the Cincinnati area as well as Indianapolis, either preaching or providing marriage seminars. I am passionate about marriage ministry in the Hispanic church because this is one of the greatest needs in the Spanish-speaking church. As a certified premarital counselor I have had the opportunity to counsel and work with my wife to use our experience plus my education to serve our Latino brothers and sisters in the U.S. This ministry becomes even more interesting when a couple is a mix of Latino and American. This multiethnic couple mix is one of the aspects I want to continue researching and studying because it is becoming more and more common in the U.S. as the Hispanic population grows. For many Latinos who move to the U.S., church signifies all they have, where they can feel accepted, and a place where they belong. But it is not always easy for them to find a church. This represents a great opportunity for believers in the U.S. to reach out to these newcomers and to demonstrate love by meeting those physical needs. Instead of Latinos finding a church, the church can be finding Latinos. Hispanics have plenty of physical needs when they first come to this country. Not knowing the language and being foreign to the American culture is a huge obstacle by itself when starting a life in the U.S. They usually come without any savings at all, seeking any job they can find. Often they take two to three jobs in order to provide for their families. Latinos typically settle in smaller living spaces where they fit numerous family members. It is not rare to see several generations living under the same roof. Finding a school can also be an uphill task because neither the kids nor the parents can communicate effectively with teachers and the administration. This was exactly our case when we came to this country. When our oldest daughter started in the public school system, she did not speak, read, or write the English language. The first months at school were very difficult. She was unfortunate to have a teacher who was insensitive to her language needs. The teacher told our daughter during the first week of school that it was not her problem that she didn’t know English. Despite this particularly unkind attitude from her teacher, our daughter was able to make some friends in her class who helped her transition into the American culture and the English language. More that 70 percent of the student body of this particular public school is Latino, which was of great help to our daughter because many of them were already bilingual. Something that I will never forget when we first came to America was the way an elder took care of us for the first few days we were here. He was instrumental in helping us settle in Cincinnati, and his support and love did not stop there—to this day this man of God has been making sure we are doing well in every way. I have witnessed that American Christians are readily willing to help those in need. Many Christian friends from different churches have asked us recently how they can help our brothers and sisters in Venezuela who are presently experiencing many difficulties in finding food and medicine on a daily basis. When there is awareness of needs, Christians in the U.S. love to help and do it cheerfully and generously. There needs to be awareness though that Latino communities not only have physical needs but also spiritual ones. Over two years ago I met an American couple from my church who were intentionally reaching out to a Mexican family who had recently moved to their neighborhood. Despite the language barrier the couple was able to communicate with them, love on them, bring them to church, and start the discipleship process with them. I was very glad to see how an American couple boldly stepped out of their comfort zone and reached out across language and cultural barriers for the sake of the gospel. Discipleship starts by ministering first to the flesh and then to the spirit. That is the way Jesus did it. If we are to disciple someone, both aspects are important and go together. In order to meet both the physical and spiritual needs of Latinos in the U.S., I pray that there continues to be intentionality and a willingness to go to the places where they are and dare to cross cultural lines to disciple them. Miguel Lara is from Venezuela and is the Connections Pastor at Christ’s Church Price Hill in Cincinnati, Ohio. Miguel Lara The Hispanic Church in the U.S.